Full-time electrical system diagnostics – alerts the operator instantly should an electrical fault occur within wires, switches, connectors, etc., and suggests a fault location. Full-time engine performance diagnostics – alerts the operator instantly should a fault or engine concern occur. Provides engine operating parameters to the operator. Joystick steering – the operator can steer the machine without releasing his grip on the joystick controllers for enhanced operator ergonomics. Auto stabilizers – preset stabilizer-extend and retract positions saves time with each set-up of the machine for screeding pass. 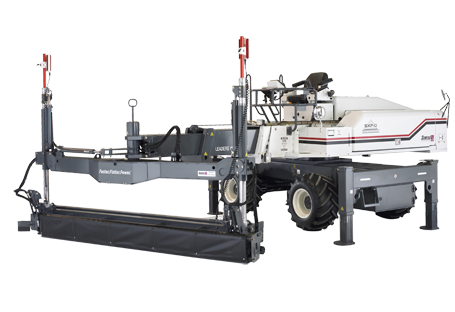 Operator-adjustable – preset boom travel, boom rotate, and head rotate speed settings for accurate and repeatable operator control.